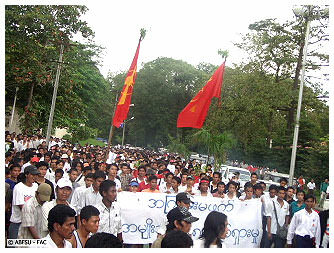 As the war being waged by the Burmese military against its own people slowly fades from international headlines, Burmese young people from all walks of life continue to step up their non-violent resistance campaign against the military leaders, while arrests and detention, violent beatings and night-time raids continue. A new generation of young activists was born on the streets of Rangoon last month. They are drawn from Burma’s young 'hip-hop' generation, as one exiled activist put it, have few memories of the upheavals and violence of 1988 and, until now, have been more concerned with a youth culture that revolves around music, computer games and trying to obtain a decent education. They have now witnessed — first hand — the brutality of their own government and have become politicised. These young people are smarter, more exposed to the outside world and more familiar with modern communication technologies such as internet and video phones than young pro-democracy activists were in 1988. With the benefit of hindsight and more than 20 years of underground organising, former 1988 student activists have joined hands with newly-formed student and youth groups across the country. These groups are expressing fresh forms of political defiance and committing themselves to non-violent strategies. And they are determined to stick it out. Committed to remaining inside Burma to advance the struggle against military rule, they have little faith in regional governments and the UN Security Council to apply effective pressure. The ABFSU went underground when its headquarters at Rangoon University's main campus were demolished on 7 July 1962 during the military coup led by General Ne Win against the democratically elected U Nu government. The organisation has remained a strong underground force in subsequent movements in Burma since, but received a shot in the arm recently, amid the brutal military crackdown. A new leadership group made up of current students was established last week. Attempts were subsequently made to arrest the new student leaders a number of days ago. While two were successfully arrested in raids, the new chairperson, Kyaw Ko Ko, managed to evade police and at the time of publication remains active. Despite the heaviest military presence in Rangoon and Mandalay in decades, activists have been able to continue their non-violent resistance and civil disobedience campaign. In Rangoon in recent days, animals such as country farm buffalos and mangy street dogs have appeared in markets and lanes sporting pictures of top military officials, inviting onlookers to 'kick them'. Being likened to a dog, considered the lowest form of animal life in Burmese culture, is deemed an insult. Despite the crackdown, activists are still able to meet and organise in secret, as evidenced by a number of statements released over recent days. The General Strike Supervising Committee comprising nine different organisations that represent monks, 88 Generation student leaders, current student and youth groups and, for the first time in Burma's political history, ethnic youth organisations, has vowed to step up their campaign of non-violent resistance. While protesters have not been able to march, they have used myriad other tactics. In the first week of October, protesters laid commemorative wreaths at the five worst sites of violence and bloodshed around Rangoon. Last week posters also appeared around downtown Rangoon sporting the words 'Killer Than Shwe'. Graffiti is becoming more and more common, and not just in the cities. Recent graffiti has particularly appealed for Burmese soldiers to join the movement for change. One example called for Aung San Suu Kyi's father, General Aung San, an independence hero and the founder of the Burma Army, to return to Burma, to not bring shame on them and to behave properly. Another student group released a swath of helium balloons into the air at Sanpya market in Thingangyun Township tied to pictures of Senior Than Shwe with the word 'Butcher' on them. 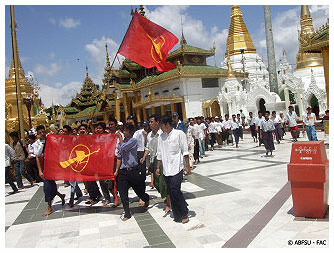 While most 88 Generation 'frontline' leaders have now been arrested, four prominent leaders of the monks' boycott are still at large and able to give media interviews to Burmese news agencies, who in turn broadcast this back into the country via both satellite radio and TV, a form of communication that the regime just cannot block. Monks have continued their call for peaceful, non-violent protest. News and images of the violent crackdown in Rangoon last month has spread quickly around the country and the population continues to roil against the regime, despite the military leader's propaganda attempts to counter such news. Pictures, such as those of a dead monk's black and bruised body floating face down in a body of water, are telling Burmese people a thousand words. This situation has the junta, which is used to exerting near absolute control over the media, apparently worried. In recent days it issued instructions to all of its regional command centers not to believe the news being broadcast into Burma from abroad. Democratic Voice of Burma set up a telephone hotline for Burmese people to ring in and identify those soldiers, police and militia members who were responsible for the killings and violence. Every week the hotline receives hundreds of calls, and ordinary people also email in details from across Burma. While the media is not able to broadcast the details, it is providing a valuable record for a future where the military are on trial for the crimes they have perpetrated. And the activists know if they push hard enough, the cracks will begin to show and the soldiers will eventually split from the ranks of the military elite. In the meantime, a long and perhaps brutal few months awaits them. With thanks to the All Burma Federation of Student Unions for photos. Recent articles by Carol Ransley & Toe Zaw Latt.